Hello friends! 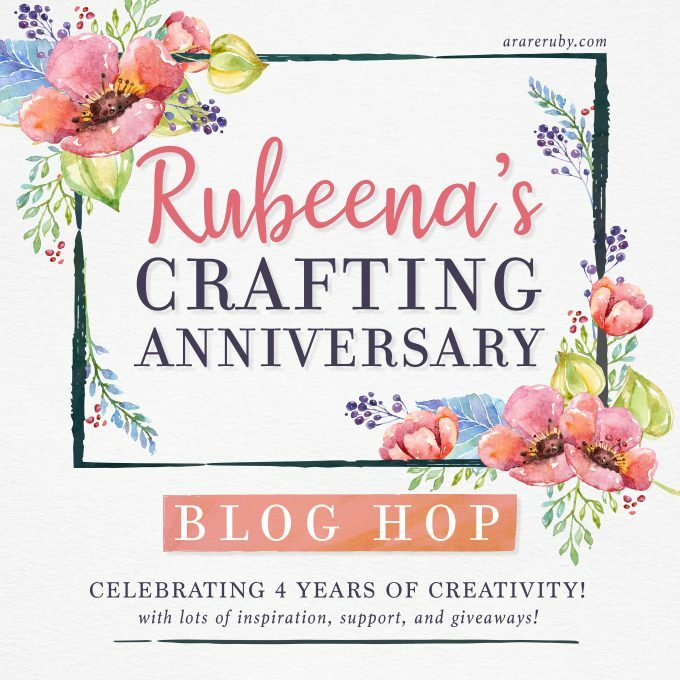 I’m delighted to be joining a very special blog hop today put together by my friend Ruby to celebrate our crafty world and crafty friendships. 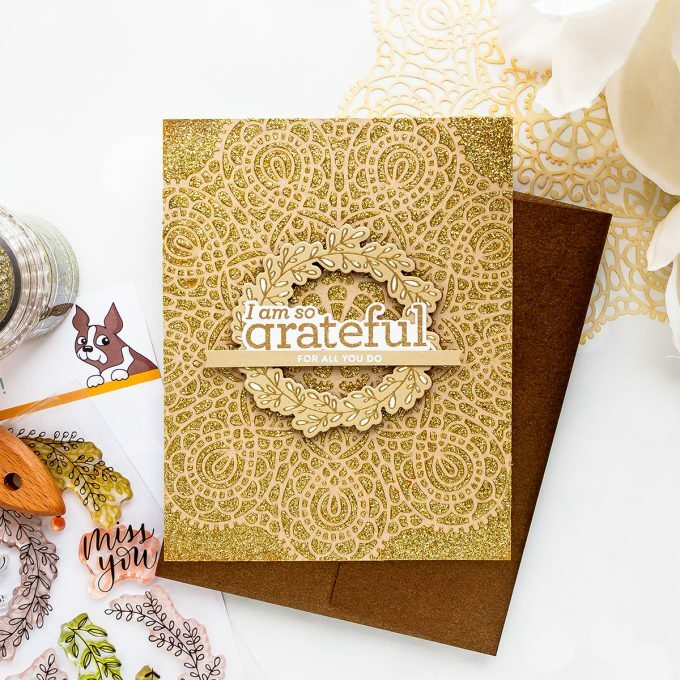 Today I have a simple card to share that is all about being grateful and appreciative of everything in our lives. I started making this card by creating a background. 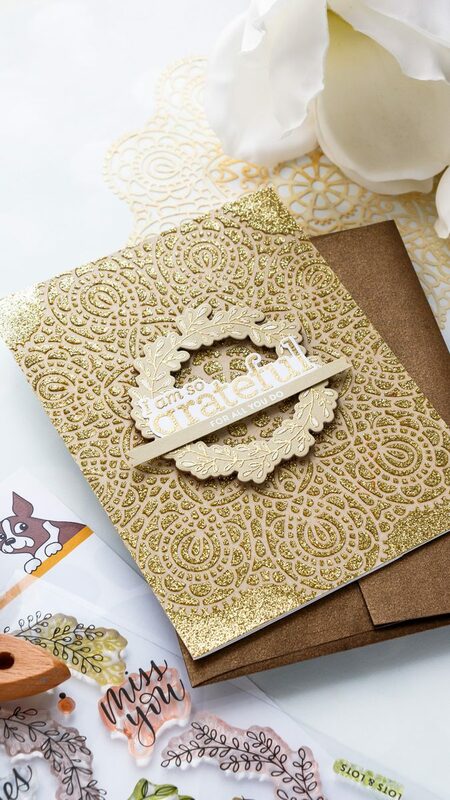 I used Tonic Studios Golden Crystal Glimmer Paste and Simon’s Circular Lace Stencil on kraft paper for this rich, glittery look. I applied a heavy layer of the paste and let it dry overnight. Next, I gold heat embossed “I’m So Grateful You’re My Mom” sentiment from the Love You Mama stamp set. I only wanted to use the top part of the sentiment, “I’m So Grateful” and substitute the bottom part with “For All You Do“. I die-cut the sentiment out using a coordinating die, at the same time I white heat embossed “For All You Do” part in white embossing powder. I also wanted to add a wreath to this card to help frame my sentiment. I gold heat embossed one from the Wreath Greetings stamp set on kraft, cut it out using a coordinating die and foam mounted onto my background, which in turn was adhered onto an A2 white card base. I used a white pen and colored the details on the wreath white. Finally, I adhered my sentiments in place forming one new message – “I am so grateful for all you do”. If you arrived from Keeway Tsao you are on the right path! The next stop on this hop is Kymona Tracey. If you get lost or encounter a broken link – start over at Rubeena’s blog. In celebration of this anniversary, we have several amazing sponsors. Winners will be randomly selected from comments left on all the blogs. The winners will be announced by Wednesday, September 5 on this page. Winners will have up to 2 weeks to contact Rubeena at ararerubycrafts@gmail.com to claim their prize before another winner is selected. 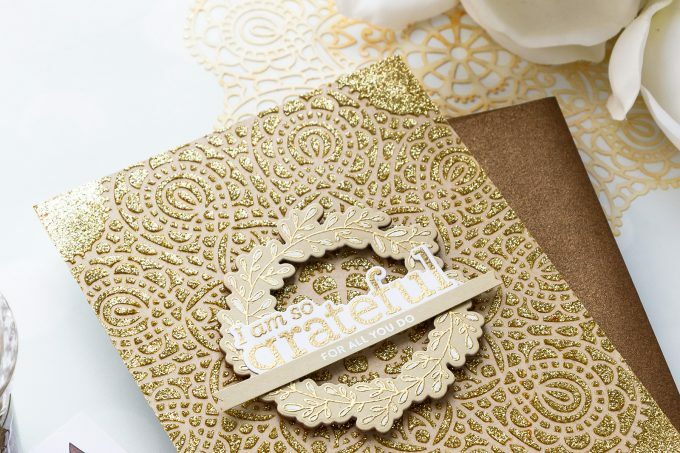 I love the opulent richness of your card! Such an elegant palette on this stunner. What a gorgeous card! The effect is stunning. This is a very pretty and elegant card. Luv it!